Secondary liver cancer. Coloured scintigram of a metastatic malignant (cancerous) tumour (red) in a liver. A metastatic tumour is a secondary cancer that has spread (metastasised) from the site of the original cancer, which in this case was a melanoma of the eye. 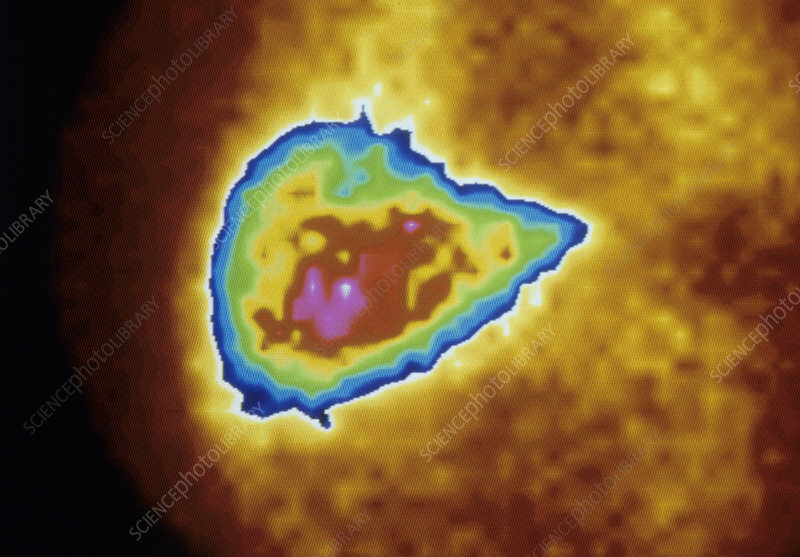 This is a cancer that arises from pigment cells (melanocytes) and that is mainly caused by exposure to ultraviolet radiation in sunlight. Melanomas are highly malignant and spread rapidly. Tumours can be removed surgically, however, once a cancer has spread the prognosis is poor. A scintigram uses a radioactive tracer that accumulates in tumours. A gamma camera detects gamma rays emitted by the tracer.